Riding Holidays in Bulgaria on beautiful, untouched nature, many wild animals on its territory. Exsiting riding holidays among the splended nature and remarkable historical monuments of Bulgaria! Equestrian Center Sivek Rohophi - Horse riding tours in Bulgaria! 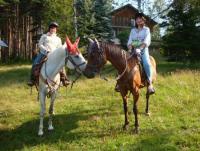 "The Horseman Ranch" Western Riding Holidays in Makotsevo, Sofia - horseback riding in Bulgaria!